a delay of up to two weeks from date of order to ship date may occur. Chain loops will ship as soon as possible, sorry for the delay. "Ripping Chain" is a special chain designed for the long, heat producing, cuts during the milling of boards when using the Alaskan Mill. Cross cutting a log is different than cutting with the grain, in that cross cutting small chips are produced and cutting with the grain "Ripping" produces long stringy fibrous strands. 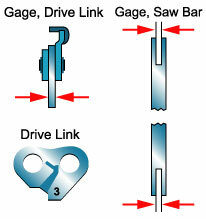 To order chain, you need to know the Pitch, Gage and number of Drive Links. 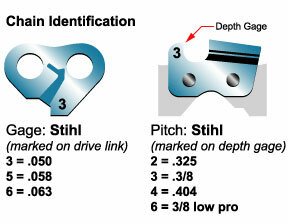 If you do not know this information, use the number on the drive link for Pitch and Gage and then count the drive links. Ripping chain should run in a bar that is not worn. A worn bar will cause the bar to wander and the mill to cut crooked. This item has FREE ground shipping Continental U.S. Specify chain PITCH(.325, 3/8 or .404), bar GAUGE (.050, .058 or .063) and the number of DRIVE LINKS. There will be a labor charge of $5.50 assembly charge per loop.